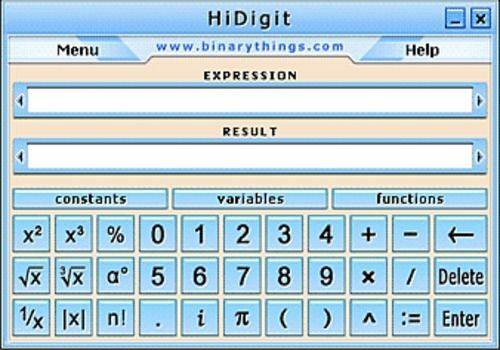 HiDigit is a new calculating software with extended capabilities. This is an essential application for math, algebra, calculus, geometry, physics and engineering students. The main advantage of the software is a simple input format even for the most complicated formulas. For example, you can enter 10pi instead of "10*pi". For complex numbers, you can use the following format - "1+2i". For percentages - "number + %". The other important feature of HiDigit is its high precision - up to 15 decimals. The program boasts an impressive number of built-in formulas, functions, constants and coefficients. Importantly, the users can customize all of them or add their own variables. Also, the history of all actions is kept, so the users can come back and undo/redo any action at any time. While HiDigit is a serious scientific software, it is extremely simple in use. No special skills or knowledge are required. The interface is straightforward and very easy to navigate through. The compact size of the software does not hinder the performance. To the contrary, the program can even be used by the multiple users simultaneously. HiDigit comes with complete install/uninstall support. Best of all, it is distributed as shareware, meaning you can download a free trial version to test the program extensively before making a purchase. Get your copy now! Calculs destinés aux électriciens et mécaniciens industriels, conversion, schéma électrique pneumatique .